Fundación BBVA’s commitment to generating new knowledge and to promoting and disseminating the most innovative contemporary creation is the hallmark of our ties with the Guggenheim Museum Bilbao as a Strategic Trustee from its very inception. 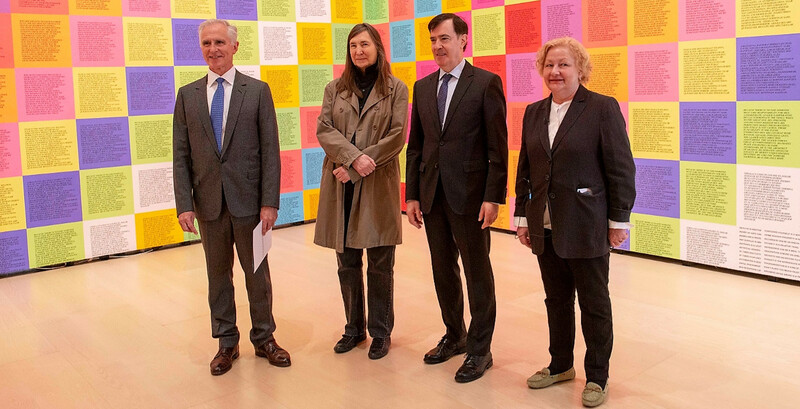 Fundación BBVA is very pleased to contribute its support to the organization of the extraordinary show Jenny Holzer. Thing Indescribable, which focuses on one of the most important conceptual artists on the international scene. Holzer’s work merges concepts and words in an output that questions not only reality but also the messages we receive on this reality in which we live. The exhibition at the Guggenheim Museum Bilbao pays tribute to Holzer’s career, from her start in the mid-1970s, when her art sprang up on the streets of New York—surprising pedestrians with her Truisms—through four decades of her career, in which art, poetry, politics, and recent history converge in extraordinary, intellectually profound works boasting an exceptional artistic dimension. Her works oftentimes take on the form of installations in dialogue with the specific sites housing them. This extensive period which the show covers reflects her position as one of the most influential and recognized artists worldwide, who has earned numerous distinctions and awards, such as the Golden Lion at the 1990 Venice Biennale. With remarkable boldness and a critical sense, Holzer addresses social issues which often entail profound questions, resorting even to humor to facilitate the interpretation of messages which, at times, can be extremely harsh. I am pleased to have offered our sponsorship to such dazzling and reflective exhibition as this one, which highlights the greatness of Jenny Holzer’s art. I would like to congratulate Juan Ignacio Vidarte and the outstanding team he leads at the Guggenheim Museum Bilbao, along with curator Petra Joos, for designing a show that offers us a new perspective on the present and will make Bilbao an essential stop in the 2019 cultural calendar.